A few months ago we lost our dear Poppi to stage 5 parkinson’s disease. Our family from near and far stuck together to get through some of the toughest of times watching Poppi try and fight his way through it. He was one of the strongest men we all knew; tough as nails, persistent as ever and always down for a stiff drink! We will all remember Poppi as the hero of a man he was before he was diagnosed with parkinson’s. Whether it be riding a tractor around our farm or kicking all of our asses at lawn darts, we choose to remember him for how he really was. Since Poppi’s passing, my Dad has frequently been visiting our cottage where Poppi loved to spend his time and weekends. Every time Dad has gone, he’s been followed by a curious little lone partridge. This bird has literally followed my Dad across the lawn, over the bridge, around the cottage and back again! It’s hard to ignore the possibility that this could be a little messenger sent by our Poppi to watch over my Dad as he continues upkeep on our farm. Because of this sweet little bird, I have created an illustration to send to whomever donates $50 or more. 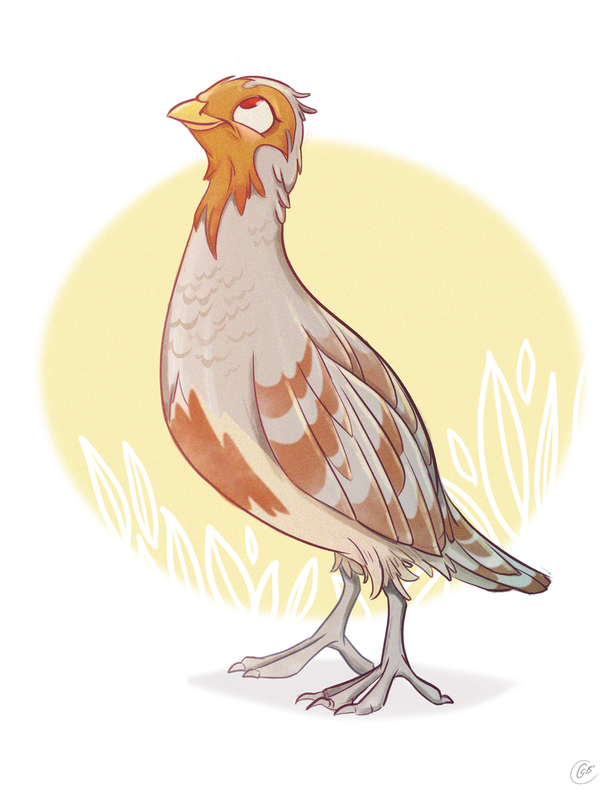 It’s Poppi’s partridge and I’ll happily send it printed on hard-stock to anyone who donates this amount or higher. Together we can help fight parkinson’s and can only hope for a cure in the nearest future. If you donate more than $50 please message us on our fundraising page in the comments and we will privately get your mailing address info. Thank you all for your kindness and support! ~ by candice on September 11, 2015. This entry was posted on September 11, 2015 at 6:06 am and is filed under Uncategorized.You can follow any responses to this entry through the RSS 2.0 feed.You can leave a response, or trackback from your own site.